Faces were lit with excitement at the Huntington Townhouse on graduation day… um, except for Joni, a former graduate, now speaker. I knew Joni from conversations we had in the hallway when the same time the prior year she prepared for her own graduation day. Her joy and thrill was palpable then. She'd been working in the field for one year, so why did she now look like a deer caught in somebody’s headlights? I was stuck on her face as the ceremony got underway and until a vivacious man arrived at the podium. The dropout rate for students of court reporting, he said, was over ninety-five percent and of the less than five percent that graduated only less than three percent made it in the field at the time. You have succeeded! he said. There was a collective gasp and I then read in Joni’s slow, serious-faced nod: Yes, folks... you, like me, are super screwed! Gooooood! You are TPUBG/G (effing) awesome! You have completed learning all the combos and passed the final exams on a machine that’s as long as your foot and not as wide. You understand that writing position is cringed shoulders, your hands together in front of you so they are almost touching (nothing Ben Gay can’t fix.) You will write your slang foreign language at 225 words per minute. I graduated and worked in the field for five years. Then I left and purchased a massage chair and a Tempurpedic neck roll pillow. 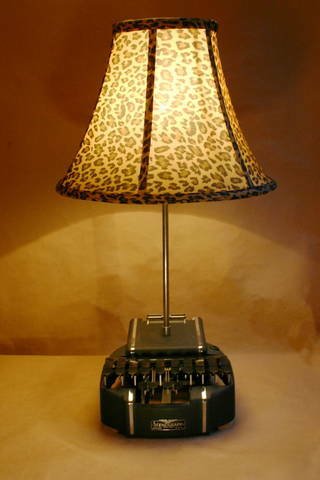 I loved the Tempurpedic neck pillow and the massage chair as a remedy to court reporting, however, I never thought of making a lamp out of my writer! The creater of this genius lamp did. It is meaninful, nostalgic and it is tpreoubg/g (freaking) awesome. It kind of says Lighten up about the past and embrace it for whatever lessons were learned!